Two members of MediaTile’s board of directors, including their Chairman, might well have a few more important things on their mind at the moment than the actual welfare of MediaTile. 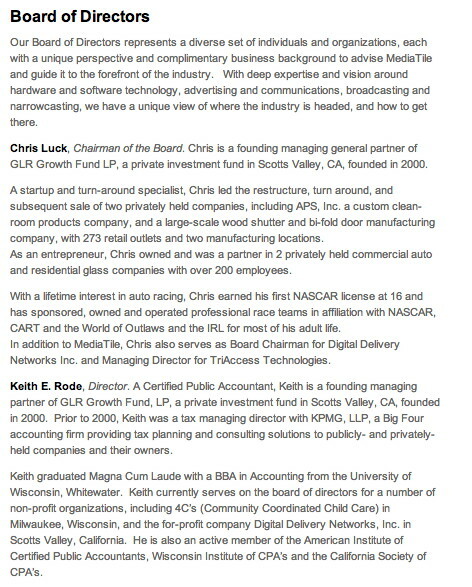 Chris Luck, founding managing general partner of GLR Growth Fund LP, a private investment fund in Scotts Valley, CA who is MediaTile chairman and Keith E. Rode a Director (and also listed as a founding managing partner of GLR Growth Fund) will no doubt be slightly troubled by the reports ‘Scotts Valley Money Manager Charged in $60 Million Ponzi Scheme‘ which emerged in several local California papers late last week. In reality, Geringer’s trading generated ‘consistent losses’ and he eventually stopped trading all together, the SEC said. MediaTile are listed as part of the GLR GROWTH FUND Investment Portfolio and secured a growth equity round of funding from them back in November 2009. Interestingly the SEC has said that by mid-2009, the fund did not invest in publicly-traded securities at all. The fund instead invested heavily in illiquid investments in two private startup technology companies. The rest of the money was allegedly paid to investors in Ponzi-like fashion with money from newer investors. It is not clear whether one of those two private startup technology companies was MediaTile but the dates of mid-2009 and November 2009 would lead many to jump to that conclusion. Just what Palmarés Advisors, who have been shopping MediaTile around for some months now, make of all this is as yet unclear. 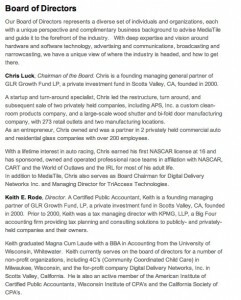 Note that GLR stands for Geringer, Luck, Rode so it is not like Mr Geringer is some junior partner. This entry was posted on Wednesday, May 30th, 2012 at 13:15 @594 and is filed under Scuttlebut. You can follow any responses to this entry through the RSS 2.0 feed. You can leave a response, or trackback from your own site. This is a far bigger problem than their MediaTile investment, which they wrote off long ago. Can you say Frog March?